With A New State Of The Art Soccer Field, Sports are Stealing the Show. The Staff at Notre Dame Academy has set a clear goal for all students who attend and participate in Sports activities. Our goal as a community is to immerse your child in a caring and respectful environment which will encourage them to grow spiritually, academically, and socially. For many students, athletics plays a major role in their social development. 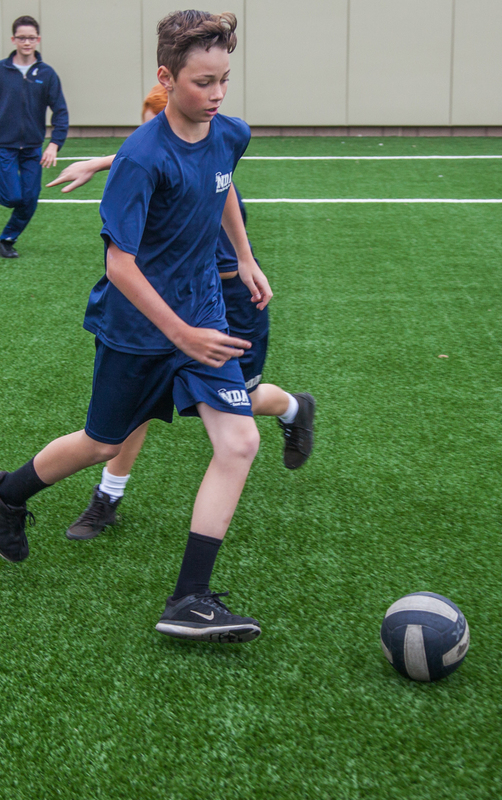 The hope of the Athletic Department at Notre Dame Academy is to give your child a positive athletic experience which reinforces the Catholic values that are the foundation of our school. It is our hope your children will develop self-respect, humility, and a high standard of integrity. Academic excellence is a big part of the NDA experience, but so is our athletic excellence. Girls Varsity Basketball team recently took home 1st place in the 2018 Pilot Invitational. While the Boys Varsity Basketball went undefeated for the season! The Coaches at Notre Dame Academy are required to model a high level of sportsmanship. We recognize that you, as parents, have the greatest influence over your child's disposition and ask for your support by modeling the proper decorum while attending sporting events. Parent participation is an essential part of our athletics program and we appreciate all our volunteers. Notre Dame Academy participates in the North County Parochial League offering junior varsity competition for grades 5/6; varsity competition for grades 7/8; and the Catholic Sports League for our K-4th grade Pee-Wee Soccer program. Track meets for grades K-8 are scheduled twice a year. A schedule of sport seasons and tournaments are offered is published at the beginning of each school year. We have two levels, a JV 5th-6th grade and a Varsity 7th-8th grade. Joining these teams is a good way to learn the skills and rules of football in preparation for high school football. Our team competes against 10 Catholic schools throughout North County. There is a pre-season tournament and post season playoffs opportunity available. Basketball at the elementary level is a starting point for athletic development and practice for working together on a team. At our middle school level, the participation is more of a commitment. There are two tournaments that NDA can participate in, a preseason tournament and an invitational tournament. One of NDA’s more accomplished teams participating in away and home games. We have both a JV 5th-6th grade and a Varsity 7th-8th grade. Preparing for the season there are two practice a week and during the season, one practice and one game a week. Girls’ volleyball is a great way to build friendships and learn team work. We rise to the challenge and take part in a local high school sponsored tournament at the end of the season. Weekly games held in Dempsey Social Hall, adjacent to our Campus. 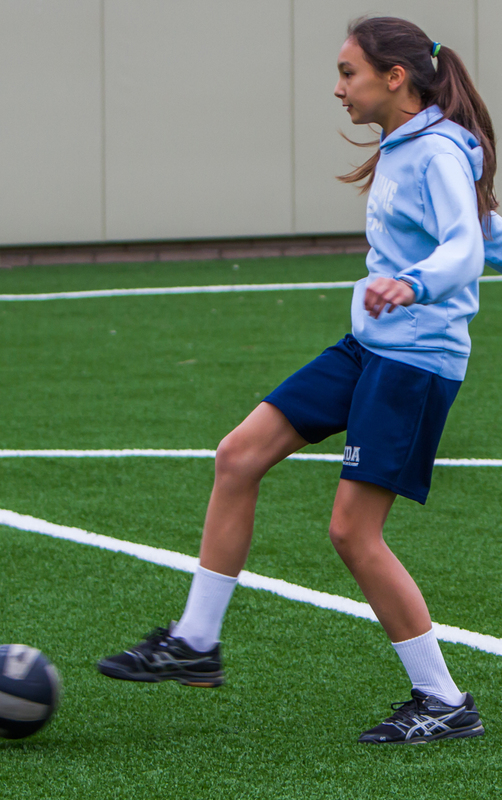 For Girls’ soccer, we field both Junior Varsity 5th-6th grade and Varsity 7th-8th grade teams. We have created an encouraging environment where we strive to do our best and reach the goal. Playoffs are held following the end of league season play. One of our most popular sports with one practice a week and one game, located next to Campus in the Dempsey Social Hall. Join the team and participate in a competitive fun sport. There are playoffs at the end of the league season. As the reigning 2017 League Champions, our girls are determined to maintain their title this year. Put your running shoes on and join us for our fall cross-country meet. All grades participate in long distance running meet. Cross-Country is a great way to improve running strength and running endurance with practice. Co-ed sport for grades K-4th. Games are on Saturday with the North County Parochial League. Soccer is a great sport for beginners and promotes whole body fitness and teaches kids teamwork. Practices and games will be scheduled for our new field on Campus. The whole school gets involved for our annual North County Catholic Schools track meet. One day for K-4th another day for 5th-8th. Our students train for speed and execution on races like the relay. Between races they can be seen keeping hydrated at our Dolphin tent and of course you will also find our NDA Parents cheering section! Notre Dame Academy fields a team if (1) A volunteer coach assumes responsibility for the team and (2) A sufficient number of students participate. The Athletic Director, or other person appointed by the Principal, will coordinate the sports program. Parent participation is essential in order to provide coaching, transportation to and from games, and to offer additional support needed by the Athletic Director. 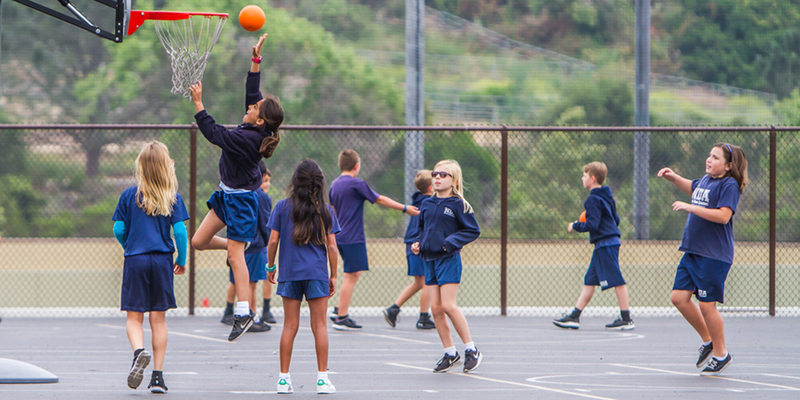 Fees are determined for each sport by guidelines offered through the San Diego Diocese. To participate in each sport, families are responsible for paying the league fee and uniform rental. Uniforms are returned at the end of each season, with the exception of the warm-up sweat suit that is kept by each participant. After school sports are a privilege and will be withheld if a student’a grade point average falls below a 2.75 during the sport season.